Home to mouthwatering food, thrilling rides, live entertainment, and so much more, The Great Frederick Fair is always a highly anticipated event! Each September the Frederick Fairgrounds fill with visitors from all over the country. For over 150 years students have learned about agriculture and families have bonded over funnel cake and crab dip. Even with over 40 acres of entertainment, it is difficult to miss the iconic double-decker ferris wheel towering over the other carnival rides. Games of skill and chance line the midway with prizes of all sorts to be won. 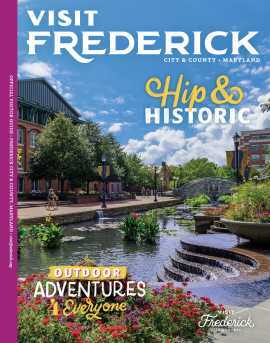 In addition to the fried treats that fairs are known for, The Great Frederick Fair offers plenty of local favorites like Hemp’s Meat Sandwiches and crab cakes from J.B. Seafood. The fair may be fun, but it is also very educational! A variety of competitions are judged during the fair showcasing photography, baking, and livestock. Showcasing the rich agricultural heritage of Frederick County, the fair hosts a variety of farm-related events and activities. Each year visitors anxiously await the arrival of baby animals at the birthing center. There is no shortage of notable live entertainment. From world famous country singers to a demolition derby, the grandstand is full of activity every night of the week. This year’s fair comes to town September 14-22, 2018.